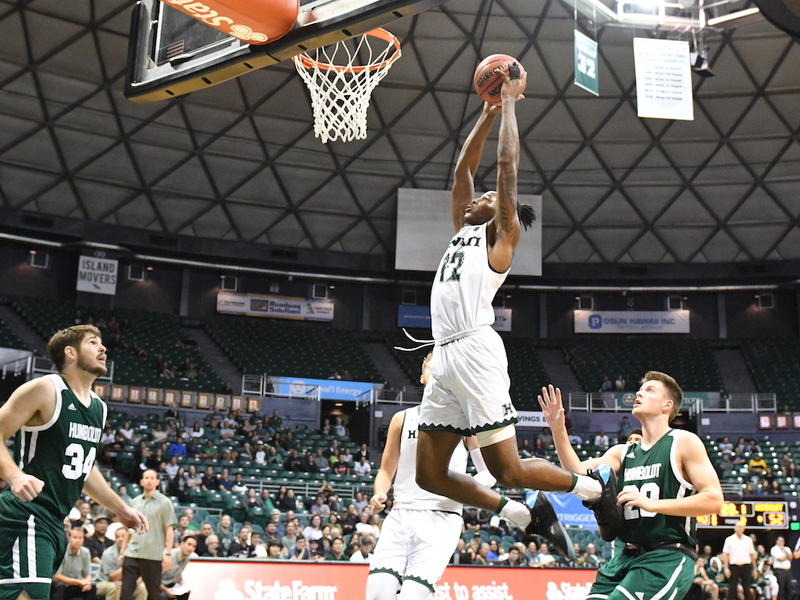 Fine-tuning itself on the eve of the season’s first big test, the University of Hawai’i men’s basketball team worked out some kinks and then sped past visiting Humboldt State, 90-54, Saturday night on Day 2 of the Outrigger Resorts Rainbow Classic. A sparse Stan Sheriff Center crowd of about 2,800 watched Eddie Stansberry come off the bench to score a game-high 16 points — including 5-of-9 shooting from 3-point range — and Jack Purchase add 15 points and seven rebounds as the Warriors improved to 2-0 heading into Sunday’s tournament finale against North Texas (3-0) at 6 p.m. Humboldt State, which competes in NCAA Division II, fell to 0-2. Brocke Stepteau contributed 13 points, three assists and two steals, Mate Colina added 10 points and four rebounds and Zigmars Raimo scored seven points to go with a game-high 12 boards for UH, which used a 20-0 run midway through the first half to blow open the game and never look back. The Lumberjacks stayed surprisingly close early, with Jackson Strong’s 12-foot jumper from the right baseline bringing them to within two points at 13-11 with 10:14 remaining in the first half. 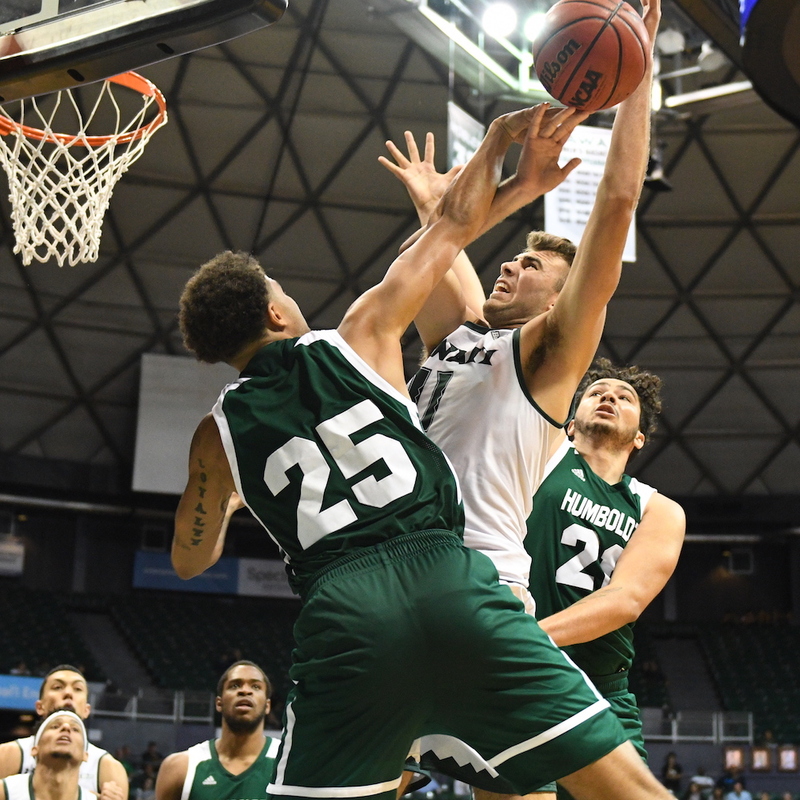 But Colina answered with two free throws at the midway point to ignite a 20-0 run for Hawai’i, capped by Stepteau’s free throw that made it 33-11 with 5:45 left. Purchase highlighted the run with two 3-pointers, and Buggs converted a traditional three-point play with a spectacular reverse layup and free throw. After LJ Williams finally snapped the run with two free throws to close it to 33-13, Stansberry buried a 3-pointer from the left wing to start an 8-2 mini-run culminating in Stepteau’s floater that pushed the lead to 41-15 at the 3:35 mark. Stepteau later gave the Warriors a 47-21 halftime lead by working the clock down and then driving in for a tough-angle banker from the right side just two ticks before the horn. The Lumberjacks later got as close as 60-38 after Zachary Christian’s 18-foot jumper with 12:39 remaining, but Samuta Avea responded with a three-point play to spark a 16-2 run capped by Brandon Thomas’ three-point play that effectively sealed the victory at 76-40 with 8:05 left. UH, which received 27 points off the bench in Friday’s 82-64 victory over Portland, got a stunning 45 points from its reserves Saturday night. Colina, a 7-foot freshman from Melbourne, was particularly impressive with his inside play and also sank all four of his free throw attempts. Justin Hemsley, a 6-5 redshirt freshman from Rancho Cucamonga, Calif., played a career-high eight minutes and produced nine points (including seven of eight free throws), two steals and one rebound while showing some impressive athleticism. “It’s real valuable when we can get playing time for the young guys at this point in the season,” said Buggs, a redshirt sophomore point guard. “We’ve got the most confidence in those guys, and we know that they’re really good players … It’s different your first time out there playing at this speed and at this pace, and so it’s really good for them, I think it’s gonna be real valuable. You can see they already improved from last game to this game, and we’ve got confidence they’re going to continue to keep improving. Stansberry agreed, saying there is more to come. Ganot said North Texas presents the Warriors’ biggest challenge to date, which he welcomes. 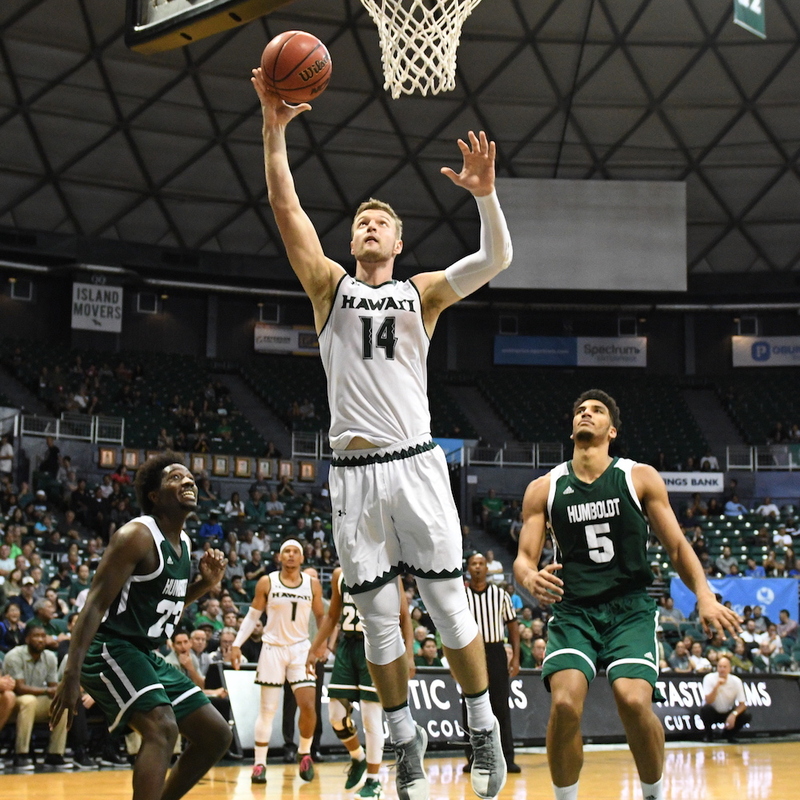 Television: All Hawai’i games will be live on Spectrum Sports – Channels 12 (SD) and 1012 (HD). 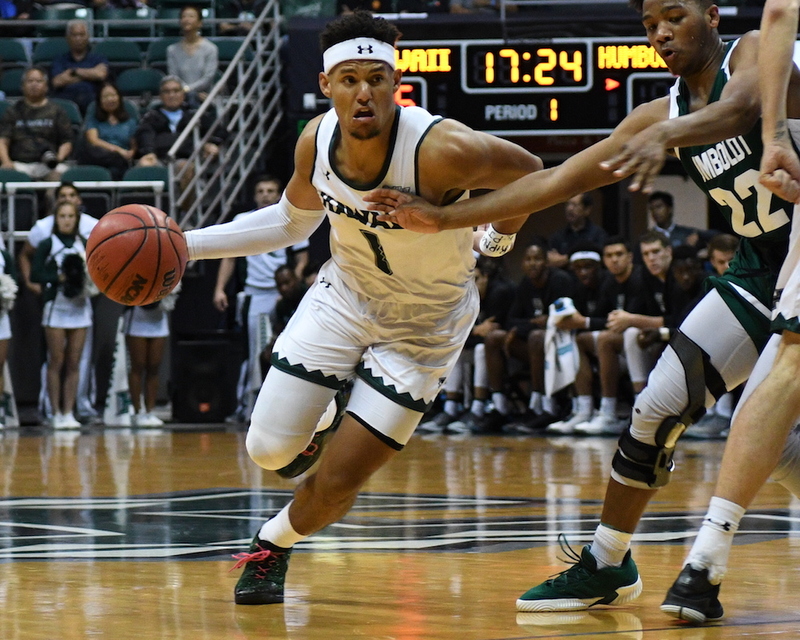 Streaming Video: All Hawai’i games on BigWest.TV (Must be a Spectrum cable subscriber to stream in Hawai’i). 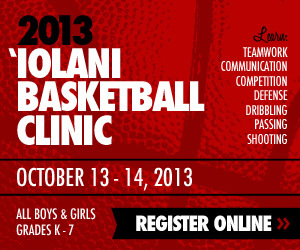 Radio: All Hawai’i games live on ESPN 1420 AM. Neighbor islands can listen live on KNUI on Maui, KPUA on the Big Island, KTOH on Kaua’i, and KNWJ in Pago Pago, American Samoa. Ticket Information: Lower Level – $30 all seats; Upper Level – $18 or $20 for adults, $16 or $18 for senior citizens (ages 65 and older), $5 or $7 for students (ages 4 through high school). Upper level prices vary by section. UH Manoa students free with validated ID. Parking is $6. So the only redshirt this season is Nedd.